How can it be the final week of the January Pootler's Design Team already? I've loved playing with this gorgeous stamp set, and found it really difficult to choose just four creations to share with you. Bella and Friends had been on my wish list since the launch of the current Stampin' Up! Annual catalogue (along with pretty much every other stamp set that hadn't yet made it into my ever growing collection - I'm such a stamp addict), and I'm delighted to share with you the final of my Bella and Friends creations for the Pootler's Design Team. Do you ever find that you buy items for your crafting stash, but never get around to using it? I'm the same, and something was calling me to finally open and use this gorgeous silver ribbon from the Autumn/Winter 2016 catalogue (now discontinued). But I think it looks amazing paired with the Silver Glimmer Paper. I started off by making the card blank out of a half sheet of Whisper White A4 Thick Cardstock. I then cut a piece of Real Red spotty paper (3 7/8" x 5 5/8") from the Brights Designer Series Paper Stack, attaching it to the front of the card blank using Snail Adhesive. I then cut a second piece of Real Red paper, this time with script (2" x 5 3/8") , adhering this to the left side of the spotty DSP. The toppers were made by stamping the image from the Bella and Friends stamp set onto some Whisper White Cardstock, using my Basic Black Archival Stampin' Pad, before colouring it in using the NEW Watercolour Pencils, Sahara Sand Classic Stampin' Pad, and Aqua Painters. Once dry, using a 1 1/2" Circle Punch, I punched out each image. The backgrounds for the toppers were then punched out of some Silver Glimmer Paper using my 1 3/4" Scallop Circle Punch (discontinued, but you can use the Layering Circle Framelits Dies instead). These were then stuck together using Multipurpose Liquid Glue, and then stuck in place onto the card. The card was then finished off with a length of silver ribbon, stuck in place using Tear and Tape Adhesive. I do hope you have enjoyed my creations for the January Pootler's Design Team, and I'd like to thank Sam (AKA Pootles) for the opportunity to join in. Who knows, maybe I'll get a chance to take part again some time in the future. I do hope so! 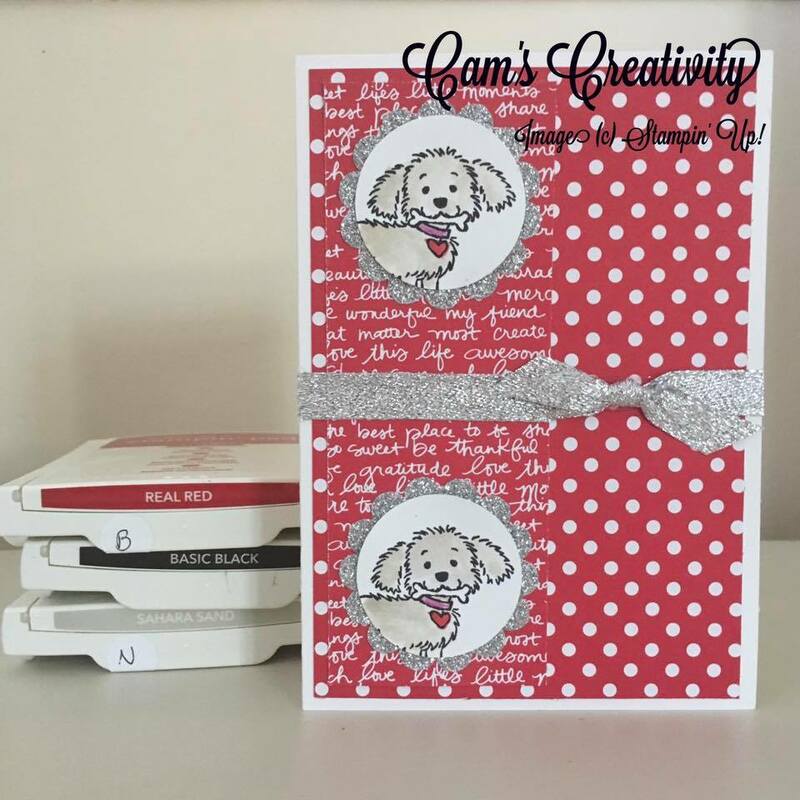 Labels: Bella and Friends, Cam's Creativity, Dogs, Glitter, Handmade Card, Pootler's Design Team, Red, Silver, Stampin' Up! Great job! Thanks for the inspiration. I just might have to try my hand at coloring!